Located between Naxos and Amorgos, Koufonisia is a small group of two islets: Pano Koufonisi and Kato Koufonisi. The two islands are separated by a narrow 200 meter (650 feet) wide strait. Pano Koufonissi is the only one that is inhabited and has all the tourist facilities. Kato Koufonisia has some beautiful beaches and a lovely church. Koufonisia is a great place to go walking and cycling or to enjoy one of its many fantastic beaches. Folegandros is a small island on the southern edge of the Cyclades with the Sea of Crete to its south. The landscape on the island is varied, and includes tall cliffs and a large cave. The capital of the island, Chora, is built on the edge of a 200 meter (650 feet) high cliff. Boats dock at the little harbour of Karavostasis, on the east coast. There are several good beaches, but many of them can only be reached on foot. The easternmost island of the Cyclades group, Amorgos is just 30 km (19 miles) in length but reaches over 800 meters (2600 feet) at its highest point. 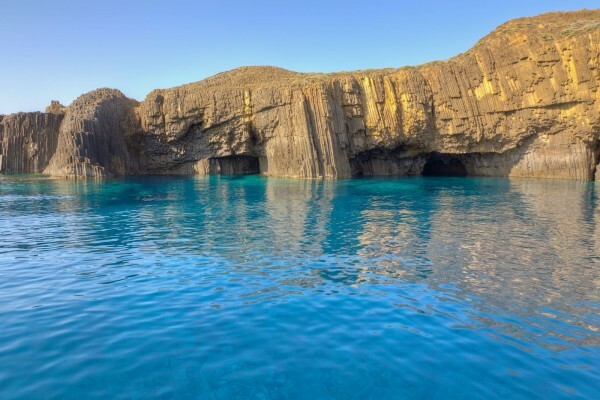 It is one of the most impressive islands in the archipelago, boasting good beaches, beautiful caves, ideal spots for diving, scenic bays and ancient footpaths leading through its steep rocky terrain. Its beauty inspired the filmmaker Luc Besson to shoot scenes of the 1988 movie “The Big Blue” in the beach of Agia Anna. Amorgos has two ports, Aegiali and Katapola while the enchanting town of Hora lies amid a rocky landscape high above Katapola. One of the smallest islands of the Cyclades and relatively rural outside of the capital Ermoupolis, Syros is a beautiful island off the normal tourist track. Despite its size it has the highest population in the Cyclades since Ermoupolis is the legal and administrative center of the archipelago. It’s a great place to experience authentic Greek island culture. Andros is the second largest and most northern of the islands in the Cyclades archipelago. The capital, Hora, is a photographer’s dream, with Aegean waters splashing on to the colorful houses that line the shore. The city is a base for famous Greek ship owners and captains. Outside the city, travelers will find sandy beaches, rocky coastlines, hiking trails up the mountains and a Frankish castle left over from the 13th century. Several island towns date back to prehistoric times, with ruins still visible. Olive oil lovers might want to take in the Olive Museum at Ano Pitrofos.